Do you have a father in law whom you’ve never seen crack a smile? Are you looking to make the most memorable birthday party for your kid, your partner, or yourself? Are you hosting a fundraising event or a university party and you’re looking for that something extra to take your event from a good one, to a great one? 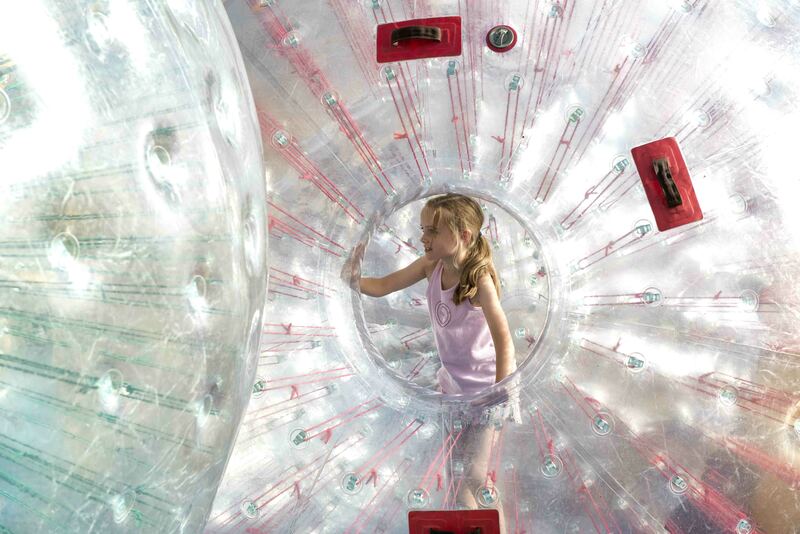 Smart Amusements know that there are few things that break the ice faster than Zorb balls. To host a party that’ll be talked about for years to come, look no further than our Zorb balls for hire. Call us today on (03) 9555 6606 to enquire about availabilities. To Zorb ball, or not to Zorb ball? We know that planning an event can sure be a hassle. There’s logistics, there’s invitations, there’s accounting for Melbourne weather, there’s remembering all the little bits and pieces that can make or break the event on the day. But perhaps most pressing – and indeed stressing – is the very real worry that people simply won’t have a good time. Amidst all the planning, it can indeed be difficult to remember why you decided to take on the responsibility at all. However, there are few more things more satisfying and rewarding than a smash hit party. 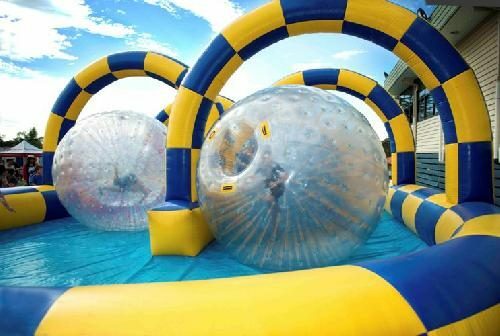 With our amazingly fun Zorb balls for young and adult alike, you’ll not have to worry about whether your guests will have fun on the big day. They’ll have a BLAST! Rain or shine – our Zorb balls on tracks will bring laughter and fun to all ages and will be remembered for years to come. Who knows, it might just become a new party favourite? 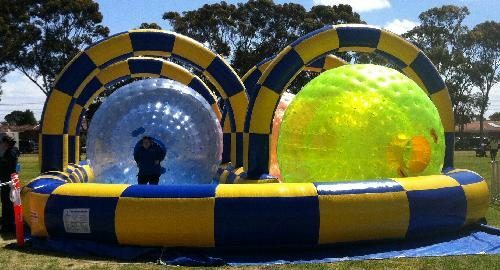 We take great care in bringing fun, safe, and clean Zorb balls to events across Melbourne. 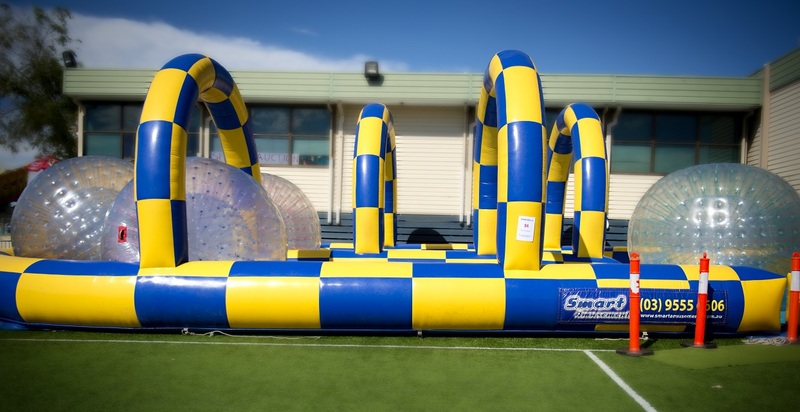 With our Zorb ball tracks, you’ll be sure that your guests (from the very young to the very old) can have heaps of fun inside the Zorb balls without the fear of rolling down a hill. A single Zorb ball track might be good for a smaller party, but for anything bigger you’ll want to give your guests a few options to choose between, so they don’t plot a mutiny in the mile-long Zorb ball queue. 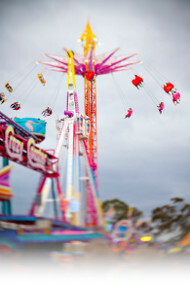 We’ve got the Star scream, tea cups, and other rides. We’ve got a range of classic carnival games to bulk out your event, too! laughing clowns, piggy races, laser tag, mini golf, high strikers, duck ponds, dunk tanks and oh so much more. Pick your favourites from when you were young – or choose the ones you’ve never had the chance to try – the choice is yours.